The Enviro World 15 gal (2 pack). Recycling Box is made of recycled materials. The quintessential blue shade with the well-known diminish, reuse, recycle logo make this the must-have item for commercial utilization. The bin might be stacked and settled for simple storage and delivery. The Bottle Bin is a unique versatile storage and transportation container for hundreds of applications around the home or cottage. This very strong completely contained bin can hold up to 150 lbs. The dual handle system allows for single hand carrying or two hand carrying for heavier loads. Perfect for gardeners, campers, cottage life, recycling, fire wood or as a cooler. Organize and transport with ease your tools or gardening equipment, pool supplies, bottle returns, weed collection, planting, boat gasoline, fire wood ,groceries or just organizing your trunk the Handy Bin is there to be used over and over again. 15 Gal. 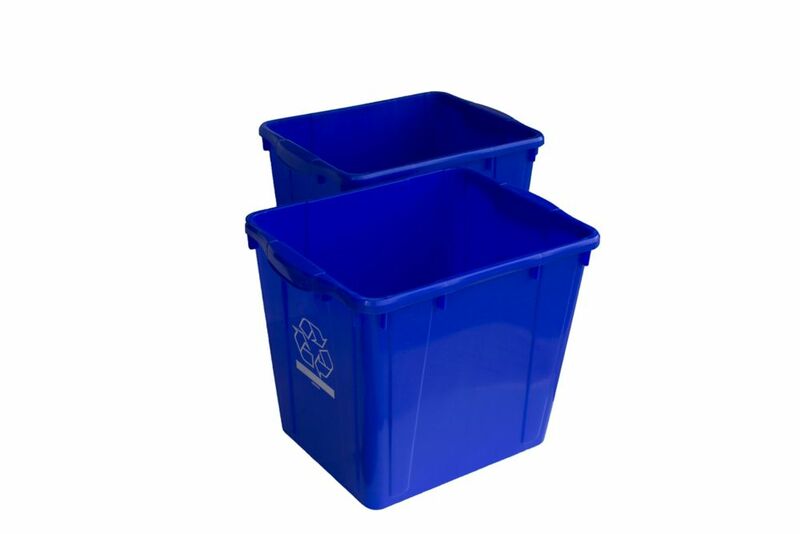 Recycling Box (2-Pack) The Enviro World 15 gal (2 pack). Recycling Box is made of recycled materials. The quintessential blue shade with the well-known diminish, reuse, recycle logo make this the must-have item for commercial utilization. The bin might be stacked and settled for simple storage and delivery.